The Daily Rundown's Chuck Todd reports on a statement that may significantly damage Mitt Romney's presidential campaign. New video caps off a brutal last three weeks for Romney… In fact, it’s as rough of a stretch as we can remember for any recent presidential candidate, especially this close to the election… Just who are the 47% Romney was talking about?... 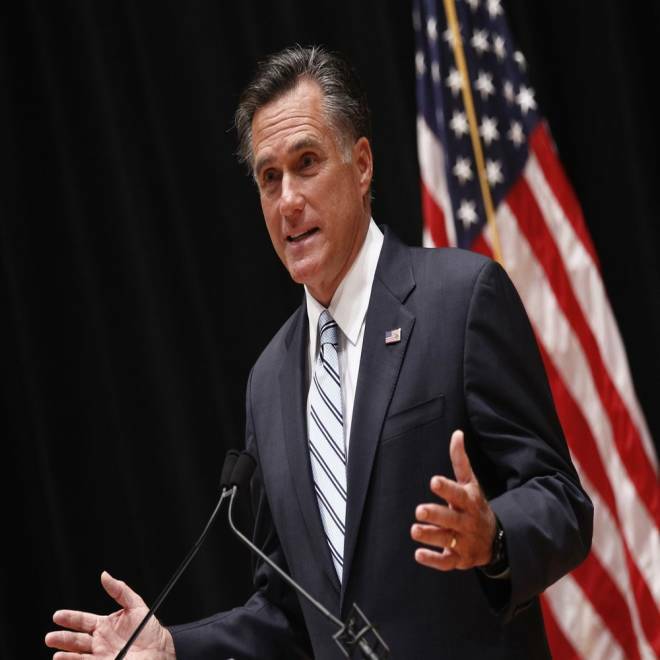 Romney calls press conference to respond to the video, but did that make things worse?... The unintended consequence of all of this: Expect more scripted and bland politicos… It’s NBC/WSJ poll day!... Romney camp goes up with new TV ad playing to female voters… And Romney’s sparse battleground state schedule. *** Romney’s brutal last three weeks: All campaigns have their ups and downs, but the last three weeks for Mitt Romney have been about as brutal as we can remember for any presidential candidate, especially this close to the election. First, the biggest speech of Romney’s life got overshadowed by the Clint Eastwood stunt. Then came President Obama’s significant bounce in the polls after the two political conventions. After that, Romney found himself on the defensive for his reaction to embassy attacks in Egypt and Libya. Next, Politico reported about infighting and disorganization inside the Romney campaign. Finally, all of these events were capped off yesterday by the surreptitiously recorded video of Romney -- provided to the liberal magazine Mother Jones and later to NBC News -- telling wealthy donors that “47%” of the country “who are dependent on government” and “who believe they are victims” will vote for Obama no matter what. What is so potentially deadly about this video is the timing, because it comes as the Romney campaign was already viewed to be behind and in crisis. Back in late July, we wrote that the presidential contest had entered halftime with Obama leading, 14-13. Now after the 3rd Quarter (the Ryan pick, the conventions, and post-convention period), Obama has scored two uncontested touchdowns, bringing it to 28-13. And now we head to the 4th Quarter (the debates). *** Other rough stretches and timing is everything: The only recent presidential candidates we can remember having as rough of a stretch as Romney is right now -- so close to the election -- were John Kerry’s tough August (the Swift Boat campaign), John McCain’s difficult mid-September to mid-October (Lehman’s collapse, Palin going rogue), and Howard Dean right before and after the Iowa caucuses (his criticism of the caucus system, the Dean scream). Of course, Barack Obama had his own rough period (Jeremiah Wright, clinging to guns and religion), but those happened in March and April, giving him plenty of time to recover for the general election. But don’t think Obama didn’t pay a price in the primaries for those comments; he lost the Pennsylvania primary, and lost later primaries by even BIGGER margins (see West Virginia and Kentucky). Which brings us back to Romney: Timing is everything in politics. Had Obama’s comments come out in September, do you think he would have won Pennsylvania by double digits in the general? GOP presidential nominee Mitt Romney defended his unguarded comments, secretly recorded at a private fundraising event in May and provided to the liberal magazine Mother Jones, that shows him speaking frankly about Obama's supporters. NBC's Michael Isikoff reports. *** Who are the 47%? The New York Times’ David Brooks may very well have the best take on the Romney video from yesterday. In a column entitled “Thurston Howell Romney,” Brooks writes, “The people who receive the disproportionate share of government spending are not big-government lovers. They are Republicans. They are senior citizens. They are white men with high school degrees. As Bill Galston of the Brookings Institution has noted, the people who have benefited from the entitlements explosion are middle-class workers, more so than the dependent poor.” Brooks concludes with this biting line, “Personally, I think he’s a kind, decent man who says stupid things because he is pretending to be something he is not — some sort of cartoonish government-hater. But it scarcely matters. He’s running a depressingly inept presidential campaign.” Indeed, while nearly 47% of the country doesn’t pay federal income taxes, many of these folks DO pay payroll, state, and local taxes. What’s more, a lot of them are seniors, and most of them would never describe themselves as dependent on government even if they were. *** Did calling a press conference make things worse? Romney responded to the video by holding an impromptu press conference last night in California. Per NBC’s Garrett Haake, Romney said his comments in that video were “not elegantly stated,” but he also didn’t distance himself from the remarks. "Of course individuals are going to take responsibility for their life, and my campaign is about helping people take more responsibility and becoming employed again.” But here’s the question we have: Why did Romney call a press conference if he was going to stand by his remarks? Why not just stand by the already-released statement or release a statement saying he was inelegant? All the presser seemed to do was elevate the urgency and significance of the video and feed the belief the campaign had to respond and apologize even if they weren’t going to apologize. It was a classic, “Well, we have do SOMETHING, and maybe SOMETHING is better than nothing.” But he still didn’t really respond to the most damning quote he made, describing 47% of the country as “victims.” Candidate Obama used his “bitter” controversy to say, “Yeah, I’d be bitter too in this economy,” etc. etc. Romney is more of a political survivor, he doesn’t seem to know how to get himself out of jams, just waits for others to self-destruct (see GOP primary). *** Winning over the bare minimum: There’s another part of Romney’s discussion about the “47%” that struck us. "My job is not to worry about those people,” Romney says in the video. “I'll never convince them they should take personal responsibility and care for their lives. What I have to do is convince the 5-10% of people who are independents, that are thoughtful, that look at voting one way or the other depending upon, in some cases, emotion, whether they like the guy or not." But here’s the thing, especially for the first-time nominees: There’s usually an optimistic streak to all of them (Kennedy/Reagan/Clinton/W. Bush/Obama) in those initial campaigns. They struck us as candidates who wanted two-thirds of the country behind them once they got elected. Yes, they might only get 51% or 52% of the vote, but they want their post-inauguration approval rating to be in the 60s. That’s where a president gets his power, especially in that first year in office. Yet here you have Romney pretty much admitting that he only wants to win over the bare minimum. It’s a very cynical and defeatist attitude, more in line for someone seeking a second term, when the idealism has been washed away by the cold hearted nature of Washington. The last chunk of voters elect “new presidents” because they want to believe it’ll be different. Romney is essentially conceding that if he wins, we’ll still be hopelessly divided. *** The unintended consequence: And here’s a final unintended consequence of the video: It’s only going to make politicians more scripted and stale. Even the folks who shell out $50,000 in contributions aren’t going to see an unguarded moment from political candidates. Everything -- and we mean everything -- is going to be considered for public consumption. *** NBC/WSJ poll day! So where does the presidential contest stand after the conventions and after last week’s back-and-forth over the embassy attacks? Well, we have a brand-new national NBC/WSJ poll that comes out beginning at 6:30 pm ET. *** Romney’s sparse battleground state schedule: Once again, Romney today isn’t campaigning in a battleground state; instead, he’s raising money. Get this: Romney’s last event in a battleground state was on Friday in Ohio, and it was just a single event. Compare that to Obama’s two rallies yesterday in Ohio (in Cincinnati and Columbus). So that’s four-straight days of Romney not being in a battleground state. In fairness, Romney was supposed to be in Colorado on Sunday, but that event got canceled after an airplane crash in the state. But time is running out for the challenger… We’ll be curious to see how Romney responds to this current campaign crisis. Bill Clinton and John McCain were candidates who doubled down on campaigning; they’d ADD events to their schedule; campaigning made them feel better, made them forget their own political troubles. Does Romney need a dose of this? NBC News airs a video featuring Donald Trump that was due to be shown at the Republican National Convention but canceled due to Hurricane Isaac. Meanwhile, the Romney campaign struggles to regain its footing after several missteps. NBC's Peter Alexander reports. *** On the trail: Obama, in New York, tapes an interview with David Letterman and then attends two fundraisers in the Big Apple, one of which is with Jay-Z and Beyonce. And tied to the Letterman appearance, the RNC releases “Obama’s Top Ten Failed Policies.” … Joe Biden campaigns in Iowa…. And Paul Ryan stumps in New Hampshire and Virginia. Republican presidential nominee Mitt Romney speaks to reporters in Los Angeles, California, September 17, 2012.